Tucked within the Riviera Palm Springs, a Tribute Portfolio Resort lies award-winning Azure Spa & Salon. 11,000 square feet of luxurious and relaxing space where a dedicated staff of therapists and specialists offer wellness and massage therapies, facial care, ritual spa packages, body therapies, hair styling services, bridal services, make-up artistry, hair removal, and nail care. Originally built in 1959 as the Mediterranean Room of the resort, where iconic performers the likes of Frank Sinatra and Elvis Presley would perform and rehearse, the space has been reimagined into a refuge of natural bamboo, crackled glass globe-shaped light fixtures and stunning tile accents – including 18 treatment rooms, the breath-taking Buddha Lounge replete with whirlpool and waterfall pool, and a retail boutique. A stylish, eclectic, cool, Palm Springs resort getaway, the Riviera Palm Springs is a resort inspired with a rich history as a destination retreat offering a free spirited, vibrant, and playful Palm Springs vibe for today’s travelers. 398 residential-style rooms and suites provide travelers with a private oasis in which to relax and unwind amongst personalized comforts and generous amenities. With 11,000 square feet of luxurious and relaxing space, a rare and expansive Watsu pool, and a staff of dedicated therapists, the Azure Spa and Salon is an experience not to be missed. Renowned for its creative menu of spa and wellness services; spa guests relax and rejuvenate with a range of healing massage therapies; deluxe facial treatments; curated spa rituals; nourishing scrubs and wraps, and a complete line of salon services from hair styling to nail care to makeup artistry. You’ll discover a wide range of amenities at The Riviera including the luxurious Azure Spa and Salon and fitness center, five restaurants, two pools, business center, dry cleaning service, retail and spa boutiques, complimentary use of resort bikes and more. Guests enjoy exceptional service from the resort’s multilingual staff and enjoy special events and activities, like Festival Pool Parties. The Riviera’s concierge service can also arrange Aerial Tramway tours and visits to nearby attractions and experiences. Thinking about a meeting or special event? The Riviera has 30,000-plus square feet of event space, including the Desert Conference Center and Riviera Ballroom. And with picturesque outdoor venues and luxurious and contemporary indoor settings, this iconic Palm Springs hotel is an ideal setting for brides and grooms-to-be. Guests at The Riviera relax in luxury in 398 boutique-style guest rooms with panoramic views of Palm Springs and manicured resort grounds from private balconies or patios. The residential-style rooms and suites are a private oasis to relax and unwind and feature luxurious amenities, including marble bathrooms and lush linens. 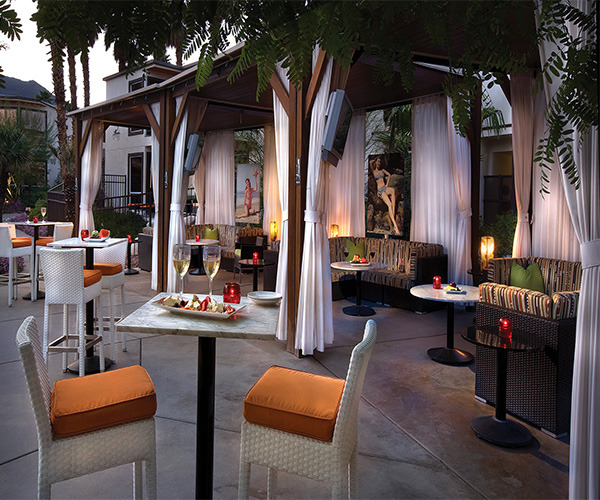 Whether you are in the mood for unique small plates and craft cocktails at the retro-chic Gypsy Rose or farm-to-fork fare at Cafe Palmetto, The Riviera offers a dining experience for every taste. Gypsy Rose’s unique menu features small plates of classic dishes with a modern twist (perfect for sharing) and inventive cocktails. If you like to dine while soaking up the sun, you’ll enjoy eating poolside on the expansive sundeck of Soleil at the Soleil Pool. The Landing is an excellent choice for cocktails and small bites, and Cafe Palmetto offers healthy options for breakfast and lunch. Cantala is the perfect outdoor hideaway to enjoy a delicious meal, with a focus on seasonal, sustainable, and local ingredients.